Making a big splash this year are millions of black plastic balls tasked with shading sunlight from the water, but it’s main purpose isn’t for saving water. The UV rays in sunlight can accelerate a chemical reaction between bromite, which is naturally found in groundwater, and chlorine, which is added to disinfect and kill disease-causing pathogens, to create bromate, a suspected carcinogen (cancer causing chemical). The EPA sets minimum standards for drinking water, and requires all reservoirs be covered for various reasons, this being one. So why the balls? 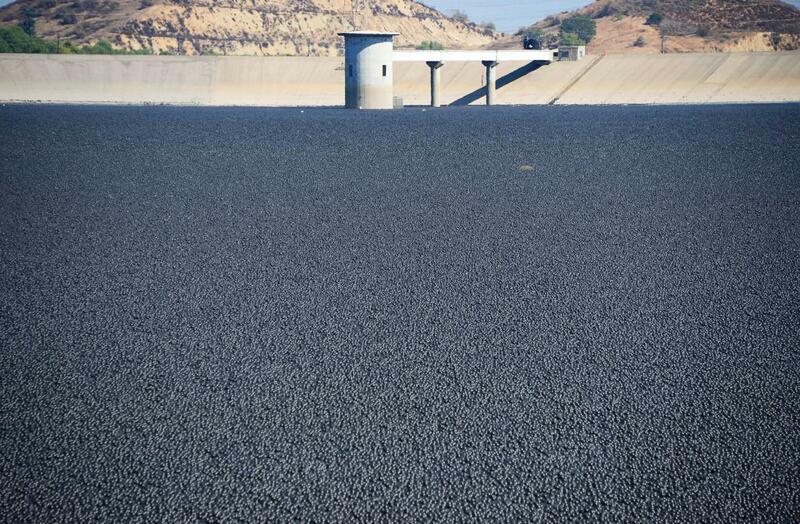 In 2008, the Ivanhoe Reservoir was covered with plastic shade balls by the LA Department of Water and Power for exactly that reason. Nowadays, another benefit is being trumpeted, water savings. Although still not the balls primary function, or most efficient quality, it does help fight evaporation (reduces it by up to 80-90 percent), estimated to save 300 million gallons of water annually at the LA Reservoir. For big drought years, like the one California and most of the West is currently experiencing, every little bit helps. Other benefits include decreasing algae blooms and keeping wildlife away, which will save costs on further treating the water through other means. Why are the shade balls black? The floating plastic balls are black because they are covered with a black food-safe coating designed to eliminate light from penetrating through into the water. Black provides the best shading results, and holds up the best against the harsh outdoor elements and UV sunlight. Even though it isn’t as effective at reducing evaporation as a reflective bright white, it’s primary function is still to prevent UV light from causing a chemical reaction. The black coating itself is created by burning hydrocarbons in an air-poor environment, producing a nearly-pure elemental carbon that meets NSF/ANSI 61 standards for contact with drinking water. At a cost of 36 cents each, the total bill comes to $34.5 million, which is a drop in the bucket when compared to alternative coverings and the overall savings. According to Los Angeles Mayor Eric Garcetti, these balls could save $250 million in treatment costs over time, while preserving 300 million gallons of drinking water (enough for about 8,100 people each year). These hermetically sealed, 4 inch diameter water-filled polyethylene balls are created to be non-degradable, with a lifespan of approximately 25 years of direct sunlight. The recently released batch of balls will be in service for 10 years, after which time they will be recycled and replaced.